Sennheiser IE 40 Pro review | What Hi-Fi? Though Sennheiser has been making pro audio equipment since the company was formed over 70 years ago, most of its headphones are aimed at the consumer market. Even the high-end HD 800 S headphones (£1200) are a more comfortable fit for a lavish listening room than a recording studio filled with Genelec monitors. But that changes with the Sennheiser IE 40 Pros, the ‘pro’ equivalent to the Momentum M2 in-ears. The sonic tuning is radically different to the Momentum series, taking a more honest approach that aims for accuracy above all else. It’s not an unreserved success, but the Sennheiser IE 40 Pros are a solid choice for people who want to enjoy their music with less hyped bass, as well as those with home studios. Our first comparison for the IE 40 Pros isn’t another Sennheiser model, instead this pair brings to mind the Shure SE215s, introduced eight years ago. Many hallmarks of pro-style in-ear monitor (IEM) headphones are present. The cabling is removable, and uses what appears to be a customised MMCX socket with an ultra-slim housing on each earpiece. The IE 40 Pros are worn with the cable trailing over your ears, with the top part holding its shape using what Sennheiser calls its ‘innovative internal cable duct’. In practice, this flexible part of the cabling is much like that of the Shure SE215s or Brainwavz B400s. This over-ear fit won’t suit all tastes. But while Sennheiser says it’s designed for on-stage musicians, it also helps reduce cable noise when exercising. The Sennheiser IE 40 Pros lack some of the common features of today’s most popular headphones. There’s no wireless option or noise cancellation, and no in-line remote. The accessories package consists of a small synthetic leather case, three pairs of silicone and one pair of foam tips. In many ways, these are quite unlike most headphones Sennheiser currently makes. But in one crucial respect, they are the same. 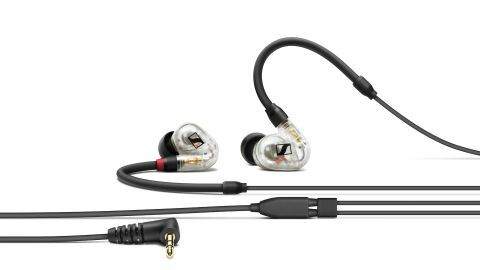 While most higher-end professional IEMs use balanced armature drivers, the IE 40 Pros use a pair of 10mm dynamic drivers. Higher-end models in the Pro line, the IE 400 Pro and IE 500 Pro, use smaller 7mm drives, but Sennheiser has done a good job of wrangling what seems like a conventional dynamic driver into producing audio suitable for the Pro label. These in-ears are detailed and balanced, though they lose a little warmth and weight bass in the process. Mid-bass has been whittled down to avoid lower frequency clogs, often used by rival earphones to produce a listenable sound with relatively low-end hardware. The bass does still have some depth and punch, though, which is a clear benefit of using a dynamic driver rather than a single balanced armature. There are other trade-offs to the surprisingly non-Sennheiser-like signature sound. Mids sound slightly recessed, and notably anaemic. Vocals lose some of their natural body and warmth, making them harder on the ear for longer periods of listening. The treble has also been emphasised to enhance the perception of detail. It doesn’t end up distractingly harsh or sibilant, but can be a little obvious. Sennheiser has rejected its usual sonic security blankets here, making the IE 40 Pros a better pair for monitoring a mix than its mainstream equivalents. However, in aiming for studio monitor-like sound, Sennheiser has made them a less easy-going listen than some rivals, including the Shure SE215s. Sennheiser has left out many of the trappings of ‘normal’ earphones at the price, including an excess of mid-bass and even an in-line remote. The result is a nicely balanced sound and a detailed, more truthful presentation, but also one that’s less easy on the ear. This is worth bearing in mind if you’re after a pair of headphones for enjoyment, rather than analysis.